FortiPhy UltraEndurance chromium-nitride (CrN) coating process to minimize tool distortion while optimizing tool life for a couple of unique applications. The coating, patented PVD technology from Phygen Coatings Inc., Minneapolis, MN, has delivered three times the tool life as compared to an alternative coating process, while maintaining part tolerances. 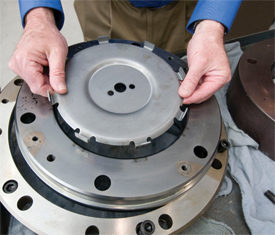 Exedy America uses transfer presses to produce transmission parts—such as torque converters—for automotive OEMs and aftermarket sellers. It stamps hot- and cold-rolled steel 1-5 mm thick. For proper assembly, parts must maintain their roundness, and according to the firm’s tool and die director Randy Collinsworth, prior use of thermal-diffusion (TD) coatings had caused problems related to tool distortion. Giving the Phygen PVD coating a look, Collinsworth first tried the coating on M2 steel tooling used to form 2.3-mm-thick cold-rolled steel into a plate used in torque-converter assemblies. While tooling coated with TiCN endured for 78,000 hits before requiring recoating, the FortiPhy coating tripled tool life. Collinsworth also describes a recent cost-reduction program that had the firm re-engineer a draw ring to half the size of its predecessor. The ring is designed to be rotated to a new position (three positions in all) as out-of-tolerance wear occurs. Coated with the Phygen FortiPhy process, the ring has yet to be rotated, and Exedy America officials expect it to run 750,000 parts—250,000 per rotation—before recoating, tripling tool life over the previous ring.